Unless otherwise specified, the source voltage will be our reference for phase shift, and so will be written at an angle of 0o. Remember that there is no such thing as an “absolute” angle of phase shift for a voltage or current, since it's always a quantity relative to another waveform. Phase angles for impedance, however (like those of the resistor, inductor, and capacitor), are known absolutely, because the phase relationships between voltage and current at each component are absolutely defined. Example R, L, and C parallel circuit. 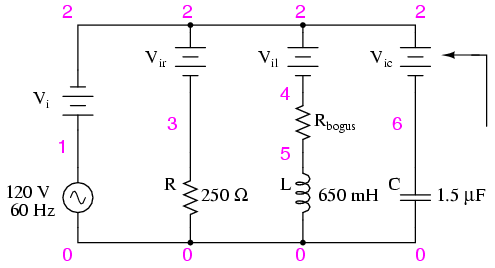 Example R, L, and C parallel circuit with impedances replacing component values. There are two strategies for calculating total current and total impedance. First, we could calculate total impedance from all the individual impedances in parallel (ZTotal = 1/(1/ZR + 1/ZL + 1/ZC), and then calculate total current by dividing source voltage by total impedance (I=E/Z). However, working through the parallel impedance equation with complex numbers is no easy task, with all the reciprocations (1/Z). This is especially true if you're unfortunate enough not to have a calculator that handles complex numbers and are forced to do it all by hand (reciprocate the individual impedances in polar form, then convert them all to rectangular form for addition, then convert back to polar form for the final inversion, then invert). 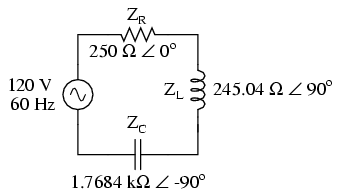 The second way to calculate total current and total impedance is to add up all the branch currents to arrive at total current (total current in a parallel circuit -- AC or DC -- is equal to the sum of the branch currents), then use Ohm's Law to determine total impedance from total voltage and total current (Z=E/I). 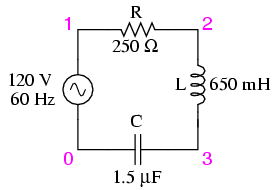 Example parallel R, L, and C SPICE circuit. 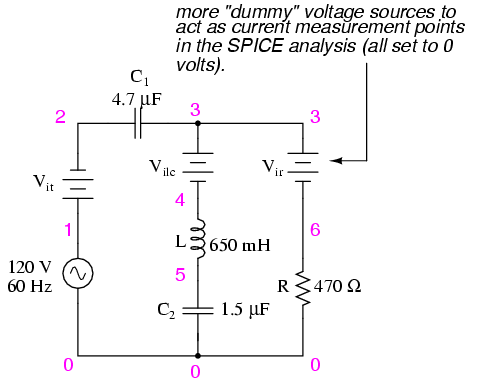 Battery symbols are “dummy” voltage sources for SPICE to use as current measurement points. All are set to 0 volts. It took a little bit of trickery to get SPICE working as we would like on this circuit (installing “dummy” voltage sources in each branch to obtain current figures and installing the “dummy” resistor in the inductor branch to prevent a direct inductor-to-voltage source loop, which SPICE cannot tolerate), but we did get the proper readings. Even more than that, by installing the dummy voltage sources (current meters) in the proper directions, we were able to avoid that idiosyncrasy of SPICE of printing current figures 180o out of phase. This way, our current phase readings came out to exactly match our hand calculations. Now that we've seen how series and parallel AC circuit analysis is not fundamentally different than DC circuit analysis, it should come as no surprise that series-parallel analysis would be the same as well, just using complex numbers instead of scalar to represent voltage, current, and impedance. A quick double-check of our work at this point would be to see whether or not the voltage drops across C1 and the series-parallel combination of R//(L--C2) indeed add up to the total. According to Kirchhoff's Voltage Law, they should! With one last step (actually, two calculations), we can complete our analysis table for this circuit. 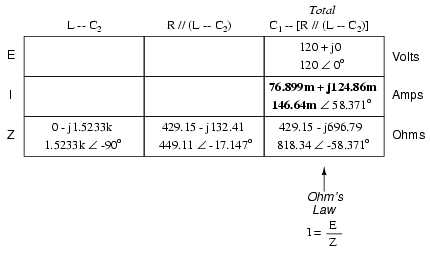 With impedance and current figures in place for L and C2, all we have to do is apply Ohm's Law (E=IZ) vertically in those two columns to calculate voltage drops. As daunting a task as series-parallel AC circuit analysis may appear, it must be emphasized that there is nothing really new going on here besides the use of complex numbers. 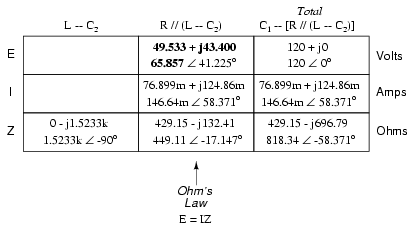 Ohm's Law (in its new form of E=IZ) still holds true, as do the voltage and current Laws of Kirchhoff. 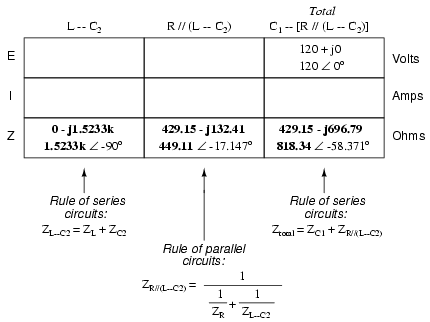 While there is more potential for human error in carrying out the necessary complex number calculations, the basic principles and techniques of series-parallel circuit reduction are exactly the same. In the study of DC circuits, the student of electricity comes across a term meaning the opposite of resistance: conductance. 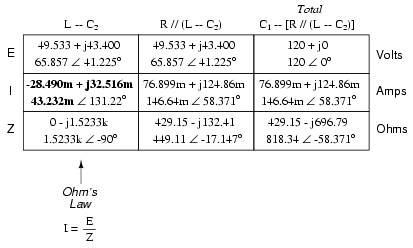 It is a useful term when exploring the mathematical formula for parallel resistances: Rparallel = 1 / (1/R1 + 1/R2 + . . . 1/Rn). Unlike resistance, which diminishes as more parallel components are included in the circuit, conductance simply adds. Mathematically, conductance is the reciprocal of resistance, and each 1/R term in the “parallel resistance formula” is actually a conductance. Whereas the term “resistance” denotes the amount of opposition to flowing electrons in a circuit, “conductance” represents the ease of which electrons may flow. Resistance is the measure of how much a circuit resists current, while conductance is the measure of how much a circuit conducts current. Conductance used to be measured in the unit of mhos, or “ohms” spelled backward. Now, the proper unit of measurement is Siemens. When symbolized in a mathematical formula, the proper letter to use for conductance is “G”. Reactive components such as inductors and capacitors oppose the flow of electrons with respect to time, rather than with a constant, unchanging friction as resistors do. We call this time-based opposition, reactance, and like resistance we also measure it in the unit of ohms. As conductance is the complement of resistance, there is also a complementary expression of reactance, called susceptance. Mathematically, it is equal to 1/X, the reciprocal of reactance. Like conductance, it used to be measured in the unit of mhos, but now is measured in Siemens. Its mathematical symbol is “B”, unfortunately the same symbol used to represent magnetic flux density. The terms “reactance” and “susceptance” have a certain linguistic logic to them, just like resistance and conductance. 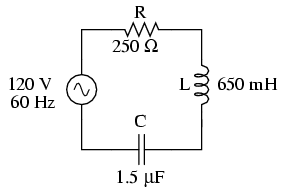 While reactance is the measure of how much a circuit reacts against change in current over time, susceptance is the measure of how much a circuit is susceptible to conducting a changing current. If one were tasked with determining the total effect of several parallel-connected, pure reactances, one could convert each reactance (X) to a susceptance (B), then add susceptances rather than diminish reactances: Xparallel = 1/(1/X1 + 1/X2 + . . . 1/Xn). Like conductances (G), susceptances (B) add in parallel and diminish in series. 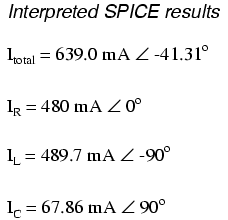 Also like conductance, susceptance is a scalar quantity. 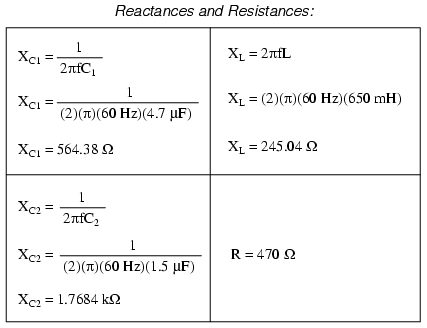 When resistive and reactive components are interconnected, their combined effects can no longer be analyzed with scalar quantities of resistance (R) and reactance (X). Likewise, figures of conductance (G) and susceptance (B) are most useful in circuits where the two types of opposition are not mixed, i.e. 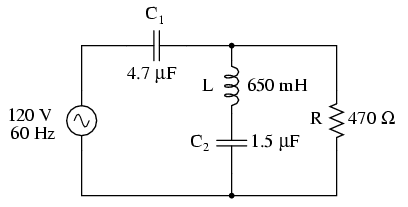 either a purely resistive (conductive) circuit, or a purely reactive (susceptive) circuit. In order to express and quantify the effects of mixed resistive and reactive components, we had to have a new term: impedance, measured in ohms and symbolized by the letter “Z”. To be consistent, we need a complementary measure representing the reciprocal of impedance. The name for this measure is admittance. Admittance is measured in (guess what?) the unit of Siemens, and its symbol is “Y”. 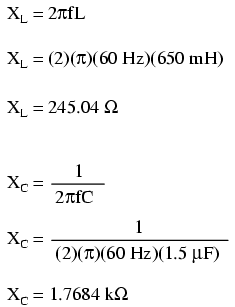 Like impedance, admittance is a complex quantity rather than scalar. Again, we see a certain logic to the naming of this new term: while impedance is a measure of how much alternating current is impeded in a circuit, admittance is a measure of how much current is admitted. Given a scientific calculator capable of handling complex number arithmetic in both polar and rectangular forms, you may never have to work with figures of susceptance (B) or admittance (Y). Be aware, though, of their existence and their meanings. 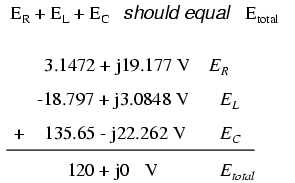 With the notable exception of calculations for power (P), all AC circuit calculations are based on the same general principles as calculations for DC circuits. The only significant difference is that fact that AC calculations use complex quantities while DC calculations use scalar quantities. 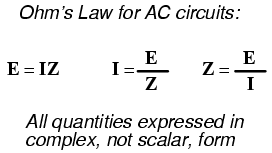 Ohm's Law, Kirchhoff's Laws, and even the network theorems learned in DC still hold true for AC when voltage, current, and impedance are all expressed with complex numbers. The same troubleshooting strategies applied toward DC circuits also hold for AC, although AC can certainly be more difficult to work with due to phase angles which aren't registered by a handheld multimeter. Power is another subject altogether, and will be covered in its own chapter in this book. Because power in a reactive circuit is both absorbed and released -- not just dissipated as it is with resistors -- its mathematical handling requires a more direct application of trigonometry to solve. Remember that only the calculated figures expressed in polar form apply directly to empirical measurements of voltage and current. Rectangular notation is merely a useful tool for us to add and subtract complex quantities together. Polar notation, where the magnitude (length of vector) directly relates to the magnitude of the voltage or current measured, and the angle directly relates to the phase shift in degrees, is the most practical way to express complex quantities for circuit analysis.